This edition has been brought to publication with the generous assistance of VADM John M. Richardson, USN, Commander, Submarine Force, and VADM Peter H. Daly, USN (ret.) CEO, US Naval Institute, in the interest of helping put this book in the hands of current and future naval professionals. It is one thing for a book to make an official reading list, but when the (then) future Chief of Naval Operations is willing to help a book to remain in print, it bears a second look. What any particular senior officer saw in this volume I can only speculate, but a couple lost weekends later, it is clear that Rules of the Game speaks to the most profound challenges facing the U.S. Navy. On the surface, a 600-plus page (708 pages with notes and appendixes) book about the Battle of Jutland seems an unlikely means to examine the established order of U.S. Navy command and control. 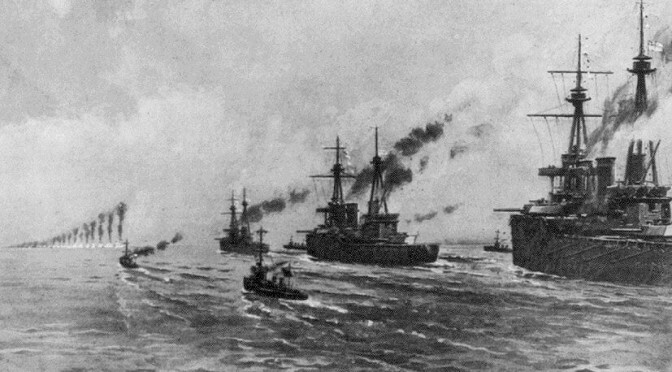 The fight between the British Royal Navy and the German High Sea Fleet in the North Sea on 31 May and 1 June 1916 was the largest naval battle of World War I. This epic clash of dreadnought battleships is widely regarded as a draw, with neither side achieving clear victory. 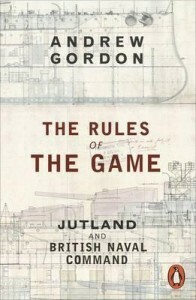 Gordon, however, turns the Royal Navy at Jutland into a long case study of the role of doctrine, training, centralization, initiative, and institutions in naval warfare. He begins his analysis as the fleet engagement at Jutland is starting, with the Battle Fleet and the Battle Cruiser Fleet, the two key combat formations that comprised the Royal Navy’s Grand Fleet, getting underway from their respective homeports 200 miles from each other. So good was British naval intelligence in this era that the Grand Fleet weighed anchor in response to a planned German sortie more than four hours before the German High Sea Fleet reached the open sea. As the narrative arrives at the moment enemy forces are in contact and key tactical decisions are being made, Gordon shifts his view back a century. In a 200 page excursion, he introduces the competing naval schools of thought and the resulting institutional habits and personal relationships that led to the British fleet acting as it did at Jutland. Britain left the Napoleonic Wars with a navy second to none and a tradition of victory built on the aligned independence of Nelson’s band of brothers. Nelson’s famous flag hoist opening Trafalgar was the last he made during that battle – not because of his death, but because he needed no other. Shortly after the war, however, new visual signaling systems promised increasing control over the movements of forces in combat. In peacetime drills, these systems yielded reliable execution of complex maneuvers. However, the reality of how this signals system would work in combat was lost over decades. In the breach, smoke from engineering and gunnery, signal masts and halyards destroyed by gunfire, signalmen lost to shot and shell, and the sheer volume of communications in a fleet engagement would conspire to negate centralized command and control. The promise of centralized control and effective coordinated combat action, however, produced a deep influence on the Royal Navy. In what Gordon memorably dubbed “the long lee of Trafalgar,” the Royal Navy continued to dominate the seas. Its officers retained the expectation of victory bequeathed them by their predecessors. That there had been no major fleet action in living memory was discussed, but rarely with concern. The French or Russian navies occasionally caused alarm, but no “peer competitor” called into question the fundamentals of the system – the rules of the game. There was good reason for this comfort. By almost every metric, the Royal Navy in the second half of the nineteenth century was extraordinarily successful. Its officers were masters of seamanship and navigation and created the standard for contemporary and modern navies. Operating forward in defense of a worldwide empire, many Royal Navy officers had seen combat and had demonstrated personal courage and resourcefulness. Beatty, commander of the Battle Cruiser Fleet at Jutland, had earned distinction – and favorably impressed a young Winston Churchill – in littoral action using river gunboats to support ground forces in Egypt. Work to understand and incorporate new technologies proceeded apace, with a limited cadre of specialists articulating the new technology to the fleet at large. There were efforts to change operational culture, most prominently spearheaded by the driven and charismatic Admiral Sir George Tyron. Tyron advocated a looser form of control, emphasizing formations following the Commander’s intent as understood or expressed in the movements of his flagship. His untimely death in a collision at sea – ironically and unfairly blamed on his style of signaling – arrested reform efforts for decades. Having allowed the German Fleet to avoid decisive battle and escape home, the Royal Navy left the field at Jutland with a sense of failure that grew as the war concluded. Denied the decisive fleet action they expected, senior British commanders engaged in decades of controversy over what signals were sent, received, intended, and expected. This controversy colors any discussion of the battle to this day. Gordon, however, seeks to move this discussion to a more profound level. While individual commanders executed the action at Jutland, their failure to exercise initiative at key moments was not truly an individual act. Indeed, Gordon asserts that the sudden exercise of tactical initiative would have been an unnatural rejection of the culture that had nurtured them through their entire professional lives. In his final chapter, Gordon draws twenty-eight specific observations from the Jutland experience. They are directed toward the Royal Navy of the early 1990s, but will resonate with serving officers today. Gordon rails against command and control being driven by the tools of information processing. Absent deliberate restraint, every increase in the capacity to transmit information produces an increase in the amount of information transmitted – with the capacity of the senior to send information, rather than the capacity of the junior to assimilate information, driving the flow. The focus too easily becomes getting the mechanisms of communications right, believing that with that information dominance achieved, success in command and control ensues. Ready access to information and the ability to transmit orders raises the level of decision making further from the point of action. When these links fail – today from jamming, cyber attack, or destruction of communications satellites – it is folly to expect naval commanders in combat will suddenly be able to shed the culture in which they have been trained. That insight brings us to Gordon’s overarching theme – how the Royal Navy dealt with a long peace, technological change, and an emerging German challenge to its comfortable dominance of the maritime domain. It is a short leap to ask to what extent the U.S. Navy remains, to paraphrase, in the long lee of Midway. It is a question the service must be comfortable asking, whether or not the answers are comfortable. Aside from its impact and insight, The Rules of the Game is delightfully written. Gordon has a knack for memorable turns of phrase and admirable clarity (if not economy) of expression that makes the long journey through his thinking as enjoyable as it is intriguing. Every naval professional’s bookshelf should have a well-thumbed copy of this volume. Captain Rielage serves as Director for Intelligence and Information Operations for U.S. Pacific Fleet, the headquarters where the Midway operation was commanded and controlled. He has served as 3rd Fleet N2, 7th Fleet Deputy N2, Senior Intelligence Officer for China at the Office of Naval Intelligence and Director of the Navy Asia Pacific Advisory Group. His opinions do not represent those of the U.S. Government, Department of Defense, or Department of the Navy. 1) In times of peace, empirical experience fades and rationalist theory takes its place. 2) The advent of new technology assists the discrediting of empirical doctrine. 3) The purveyors of new technology will be the most evangelizing rationalists. 4) Rationalism, unlike empiricism, tends to assume an accretion of vested interests. 5) The training establishment may try to ignore short bouts of empirical experience to preserve its ‘rationalist’ authority. 6) Military cultures impart doctrine by corporate ambience as much as by explicit teaching. 7) In long periods of peace, ‘ambient’ doctrine may be no more than the habits of years in which war has been forgotten. 8) If doctrine is not explicitly taught, vested interests will probably ensure that wrong doctrine is ambiently learned. 10) Innovations adopted in accordance with peacetime doctrine may lock the Fleet into both systems and doctrine which will fail the empirical test of war. 11) Purveyors of technical systems will seek to define performance criteria and trials conditions. 12) A service which neglects to foster a conceptual grasp of specialized subjects will have too few warriors able to interrogate the specialists. 13) The volume of traffic expands to meet capacity. 14) Signals ‘capacity’ tends to be defined by how much the senior end can transmit rather than how much the junior end can conveniently assimilate. 15) Signal prioritizing mechanisms become dislocated in times of overload. 16) Incoming traffic can act as a brake on decision-making. 17) The more signals, the more the sun shines on signalers. 18) The ‘center’ must subject its own transmissions to the strictest self-denying ordinance. 19) Signaling promotes the centralization of authority. 20) There is an inverse law between robust doctrine and the need for signaling. 21) Heavy signaling, like copious orders, is symptomatic of doctrinal deficiency. 22) The promise of signaling fosters a neglect of doctrine. 23) War-fighting commanders may find themselves bereft of communications faculties on which they have become reliant in peacetime training. 24) Properly disseminated doctrine offers both the cheapest and the most secure command-and-control method yet devised by man. 25) Every proven military incompetent has previously displayed attributes which his superiors rewarded. 26) Peacetime highlights basic ‘primary’ skills to the neglect of more advanced, more lateral ‘secondary’ abilities, the former being easier to teach, easier to measure, and more agreeable to superiors. 27) The key to efficiency lies in the correct balance between organization and method. 28) Doctrine draws on the lessons of history. As a professional historian and former naval officer, I must disagree with my former Miami University shipmate Dale Rielage and suggest that “Rules of the Game” is not a good review of the capabilities and limitations of the RN of 1916, nor of the potential problems associated with the present US Navy. Gordon’s work is dated and does not include newer scholarship from authors like the late DK Brown, John Sumida (since In Defense of Naval Supremacy), and Nicholas Lambert. The RN was a very forward thinking organization that developed fuel oil for ships, director-fired gunnery, turbine engines, wireless telegraphy and a host of other innovations. Rather than suggest that the RN at Jutland failed to act aggressively, or exploit key German mistakes, the action instead represents the height of capabilities for a battle fleet in the early 20th century. British losses at Jutland and failure to destroy the German fleet were not due to a culture of timidity or subservience within the RN that had developed over the Victorian and Edwardian periods. They were instead the products of poor tactical doctrine and bad shells. DK Brown and Nick Lambert both document poor British tactical doctrine that allowed safety measures within gun turrets to be bypassed in order to achieve high rates of fire. Turret tops represented 17% of the total target area of a WW1 dreadnought and were often hit in combat. When the safeties were in place, there were no magazine explosions. British battlecruisers were far from fragile as generations of historians were led to believe. HMS Tiger, for example, suffered more heavy shell hits (17) in the battle than any other battlecruiser and remained in action throughout the engagement. Poor British shells that failed to detonate allowed many German ships that should have been sunk to return safely to port. After the battle, the RN’s Constructor office (the RN version of NAVSEA at the time), conducted an extensive investigation of the battle and damage effects. It identified poor shell management within the turrets of the battlecruiser force and poor shells throughout the Grand Fleet. Jellicoe and Admiral Beatty (the battlecruiser commander), both had the report suppressed and instead blamed the so-called thin armor of the battlecruisers for the British losses. This myth continued throughout the 20th century and was told to post World War 2 historians like Arthur Marder and Stephen Roskill, who repeated it for future generations. More recent scholarship has set this matter straight. Finally, Jellicoe achieved some amazing feats at Jutland that are perhaps lost in the much more technological 21st century. He found an enemy battlefleet based only simple mathematics. He maneuvered his fleet using signals not much changed from Nelson’s time to bring the guns of nearly 40 battleships on target twice in fading light and poor visibility. He did not engage at night, not from timidity, but based on sound tactical experience of the time. The Russian Fleet at Tsushima (1905) lost several battleships to torpedoes and mines when they attempted to engage Japanese destroyers at night after the main battle had ended. The reader must remember that Jellicoe had no radar, limited wireless and was unsure of the location of the High Seas Fleet. The Germans, by contrast, were just lucky, RADM Ernst Weisacker, who was on German Commander Admiral Scheer’s staff said after the war that Scheer had no idea of what was going on throughout the battle and just turned tail for home at the sight of the RN’s guns. PhD Candidate in Military History, Ohio University. Hi Steve, Sumida and Nick Lambert have done a good job of giving us a fuller understanding of what happened at Jutland and especially what was going on in the Royal Navy (RN). Howard Fuller too has challenged the idea of a “fat dumb and happy” RN in the mid- to late-Victorian period. That said, there was quite a bit happening and I tend to agree with those who point to Fischer’s attempted revolution and its cultural and organizational components as being the more important. But in many ways it was a revolution that was incomplete…especially given the post-war narratives that in many cases proved flawed–especially regarding Jutland and how pernicious was Betty’s and even Churchill’s influence in clouding the historical record–Beatty and his heirs in particular with respect to Corbett (and the official history) and latterly Captain Stephen Roskill, who ran afoul the jealous heirs of Beatty (and who I actually saw at an Annapolis conference in action). Bottom line–the proof to me of the cultural and organizational hurdles as being, in the end, almost too difficult for the RN to hurdle is really the interwar period and its performance during WW II. It really was the mavericks and disesteemed folk, and the US Navy and Canadians if we are honest, who took up the slack for an organization that languished in peacetime. They were not simply habits newly acquired after Versailles or even Washington (which tended to work against the RN rather than cause it challenge its own myths). But Jutland and Jellicoe’s performance should highlight the overall soundness of Jellicoe’s and even Fisher’s approach, at least at the very top. The whole problem begins with viewing Jutland as a defeat, when in fact it was an operational victory in every sense of the word. The entire issue of what came next has clouded things, the submarine threat, but Jellicoe was not alone in surmounting those difficulties, but how he and the RN addressed the problem should not–as you argue–diminish what he was able to accomplish at Jutland. Bottom line, Gordon’s work is still useful, but his list cannot be applied as successfully if the historical context is too much misunderstood. It’s like criticizing the US Navy for its supposed “defeat” at the Coral Sea–wrong, Coral sea was an operational victory in every sense of the word and contributed measurably to the success of events afterward. The same can be said of Jutland. However, the RN had real problems, and Jutland exposed some of those, too. As for the Germans, that is another completely different book review or article! I agree with Dr. Kuehn’s comments. He gives a more comprehensive of the larger history of the period 1900-1939. From reading the book, I understood that the losses of the Battlecruisers weren’t due to thin armour but indeed to the deliberate flouting of safety regulations with regard to shell handling. But what the above commenters are missing is WHY that was so. The reason for that can be traced to the poor gunnery direction and use of an inferior director system. That lead to poor results at long range, the range the Battlecruisers were supposed to operate at. The official (in the BC fleet) response was to try to compensate for this by sheer volume of fire and ships were judged on the volume of fire they could produce. That lead directly the commanders allowing the flash protection system of interlocking doors protecting magazines to be disabled so shells could flow faster to the guns. And that lead to the magazine explosions. Andrew Gordon perhaps spends too little time of the faulty shells issue, one that spread a good deal wider than the fleet as the problems at the Somme battle with shells that failed to explode were widely known. The issue was the enormous expansion of the British munitions industry and the consequent temporary drop in quality. However the BC’s did, from contemporary records, score fewer hits on the opposing ships that the reverse. However the weakness, if it is one, of the book is that it is almost entirely focussed on the British experience of Jutland the the lead up; so the lack of a detailed discussion on the ammunition failures is understandable as they don’t immediately affect the British impressions of the battle. And just to mention Tsushima, the British fleet was in a very different situation to the Russian fleet in the aftermath of Tsushima. The Russians were thoroughly disorganized and the Japanese both organized and filled with elan at being victorious. The German fleet immediately post Jutland was neither particularly organized and the Destroyer fleets were partially dispersed and a much lesser threat than they might have been. The British were organised, in a fleet formation, and capable of communication to coordinate. One will never know how a night battle or set of significant skirmishes would have played out, but the Grand Fleet was in the best position by far to exploit them. It seems a failure of approach that sightings, numerous sightings too, of German ships were unreported all night so Jellicoe was totally unaware of them. Jellicoe indeed did a magnificent job, but by no means a perfect one.